Feb. 4, 11, 18, 25, Mar 4, 11, 18, 25, Apr. 1, 8, 15, 22, 29 May 6, 13, 20, 27 ...and weekly until the migration is completed! Welcome to Journey North's spring monarch migration season! 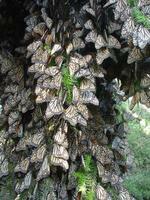 We begin each year while the monarchs are still at the over-wintering sites, deep in central Mexico. The monarch’s migration to Mexico is one of nature’s most incredible journeys. Amazingly, the same small butterfly’s story of survival during the winter months in Mexico is equally spectacular. During the coming weeks, we’ll take a close look at the monarch’s winter habitat, and the adaptations monarchs have for survival. Monarchs are famous for the spectacular colonies that they form. Some 15,000 butterflies can share a single branch. But monarchs need far more space than meets the eye, Dr. Calvert cautions in today's report. Their habitat requirements change during the season. A colony using only 1 hectare at any particular moment may have used 60 hectares by the season's end. When Dr. Calvert began his first monarch tour in Mexico this week, he realized there was going to be a problem. "Everybody learned a dramatic lesson about butterfly behavior," he said. Can you guess what happened, using these photos for clues? What do Mexico's wet and dry seasons mean for monarchs? Dr. Brower describes how monarchs come and go based on precipitation patterns. Monarchs were so scarce in the north last summer and fall, that the news from Mexico last week was not a surprise: This year's population is the lowest in a decade. The reasons? Scientists share their thoughts. "From the butterfly point of view, it looks like this is a good winter," said Dr. Calvert by phone. Where do monarchs get the water they need? Drs. Calvert and Brower share insights. 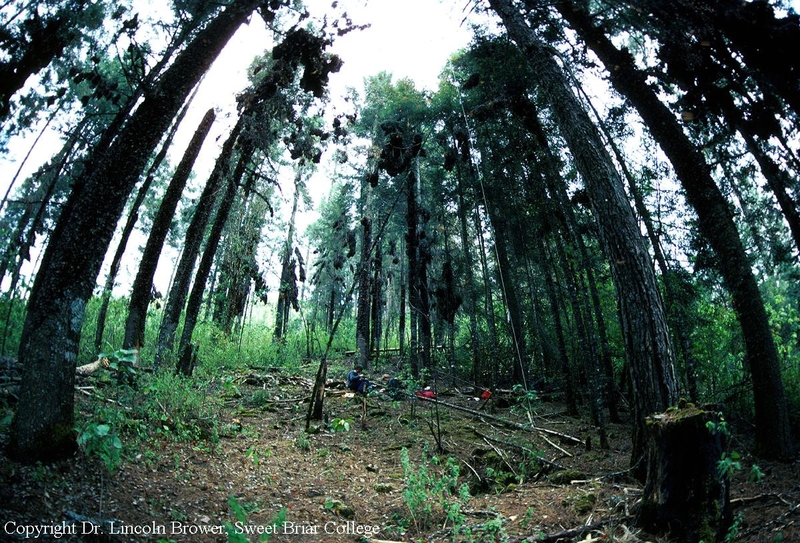 The monarch's winter forest is one of the most elegant examples of shelter in nature. Millions of monarchs fly across the continent to find safe harbor there. How is it like a blanket, an umbrella, and a hot water bottle? If the forest is cut or thinned, says Dr. Brower, monarchs will not have the shelter they need. Explain these analogies. The forest also protects monarchs from predators. Inspect three pictures and explain how. It's now mid-March. How much fat does the typical monarch have left? Running out of fuel is a common cause of death. However, the habitat doesn't provide food for millions upon millions of butterflies for five months; its cool temperatures allow monarchs to SAVE energy. Is nectar still important? Scientists don't agree. What food are monarchs about to need in great supply? How is this related to the timing of migration? Here come the monarchs! A massive exodus was witnessed last week. So many monarchs were crossing the road, hazard lights were needed to warn drivers of slow traffic. Check this pre-migration map as you prepare to track the monarchs. Remember, all did not go to Mexico. What do YOU make of the rash of migration reports from California last week? Were they monarch butterflies? Excitement is in the air! The first migrants appear to be arriving in Texas. Yet our map shows many places in Texas where monarchs were already present. How do we know which monarchs are the migrants? Read the observers' comments carefully. What evidence can you find? Butterflies from Mexico are seven months old, and their wings show their age. Try the "wing-wear" quiz and see which butterflies appear the oldest. The monarchs are on the move! They pushed into northern Texas last week and crossed into Arkansas. "The first monarch just flew into our Outdoor Classroom," came the news from Texarkana. When one flew past Dr. Edson's window he flew out the door with his net. Predict how many eggs this now-captive female monarch wil lay. Next, analyze today's migration map: Do monarchs on the Gulf Coast migrate north in the spring? Consider these questions and send your prediction. The monarchs moved into three news states during the past week. Are they traveling where you expected? Which migration pattern best matches their movement? (See maps.) Ms. Monarch has now laid 374 eggs in Arkansas. 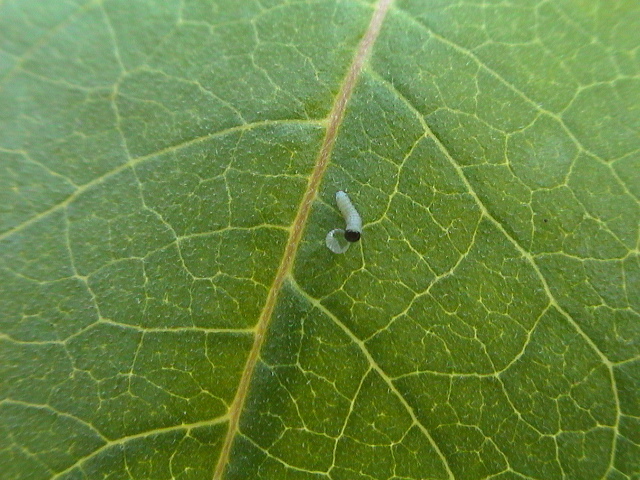 Monarch mothers don't care for their young; they just lay the eggs and move on, leaving the job to Mother Nature. How is habitat like a good parent? 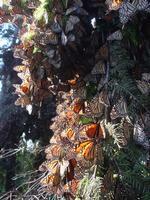 The migration has advanced as far as 39N..and female monarchs are laying eggs across the map. A single monarch, captive in Arkansas, laid 504 in two weeks. Young monarchs can raise themselves, thanks to their many adaptations. Look closely at larvae: when you see an unusual behavior or body part, ask yourself WHY. There is always a WHY behind WHAT you see. The leading edge of the migration did not advance beyond last week's 39 N, or enter any new states. As is typical in April, fewer and fewer monarchs are reported as the month goes on. Can you figure out why? A monarch has the body part pictured here only during the two weeks the monarch needs it. What is this mystery monarch adaptation? We have only 13 monarchs to report this week! Among this week's sightings was a big surprise. A monarch was reported in Illinois on April 19, from latitude 42 North! Should it be included on this spring's migration map? How unusual is this? Dig through Journey North's historic maps and data and see what you can find. Also, explore two monarch adaptations today. How does each help a monarch survive? The quiet is almost eerie. Not a single person reported their first monarch this week, the most pronounced lull between generations we've ever seen. Today's map shows where habitat matters most to monarchs in the spring. Also this week, Dr. Brower describes the moment of metamorphosis, as a butterfly changes from caterpillar to chrysalis. Why does it twist and turn so vigorously as the chrysalis forms? The big news this week is how little migration news we have! Only FOUR new sightings make this May’s migration the slowest we’ve ever recorded. Last winter's population was the lowest in a decade. What conditions do monarchs need this spring and summer? Their survival is a day by day, moment by moment effort as portrayed in this shot where the monarch avoids becoming the lizard's lunch. Monarch numbers remain low. Only 11 new sightings were reported this week. In late May in previous years 25-75 monarchs have been reported. However, the migration did advance clearly into the Midwest with first sightings in Iowa and South Dakota. This is the week we've been waiting for! A flurry of 48 monarch sightings flew in, as the migration continued its advance into the Upper Midwest. And the first monarchs have indeed crossed into Canada! The leading edge of the migration has now reached latitude 45 N. That's half way to the North Pole! How much farther north do you think the monarchs will travel? The monarchs suddenly moved into the motor state of Michigan last week as if a new freeway had been opened for them. But most surprising was the monarch in Nova Scotia. The previous Atlantic Coast report came over 3 weeks ago from NJ. We have not received a single report from anyone who lives in the nearly 600 miles between them! This is the most heavily populated part of North America. Why is the migration map so empty east of longitude 80W? The past week was the busiest week of the season! We've added 51 sightings to our map. For the first time, observers commonly saw multiple monarchs at once. This is a noteworthy change and reflects a substantial increase in the monarch population. Perhaps most striking is how SIMILAR the migration is from year to year! See the comparative maps in this week's update. The northernmost monarch has now been reported from latitude 50N in Manitoba--that's 2,147 miles north of the overwintering sites in Mexico! As the breeding season progresses, it's hard to tell which sightings reflect broader distribution (due to migration) and which reflect greater abundance (due to reproduction). Among the 75 sightings added to the map are some from the southern region of the summer breeding range. Can you find them? Copyright 1997-2005 Journey North. All Rights Reserved.